For the building, see Haven arcology. Haven, originally dubbed Wraparound, is a Halo 4 multiplayer map. 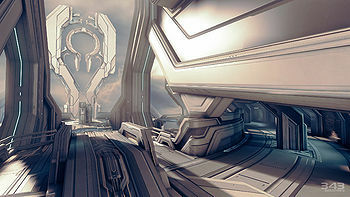 The map is set in the skies of the Forerunner shield world Requiem, within a facility that powers one of the miniature artificial stars illuminating the interior of the structure. Haven was remade as Mercy in Halo 5: Guardians. The map has two levels, catwalks and ramps surrounding a large space in the center. Around the outer edge of the map, there are circular hallways connecting either to the map's side areas or man cannons that can be used to access the map's central area. Certain areas of Haven have sound issues which result in gunshots being heavily distorted - even to the point of being beyond recognition. This is similar to the distortion produced when the player is inside a Regeneration Field. Concept art of the Forerunner towers that serves as the map's setting. Early concept art of the facility's design aesthetic. A Spartan-IV engaging another on Haven in an earlier build of Halo 4. The center of the map's upper level. Panoramic view of Haven in Forge. View of one of the ramps in Haven. View of the central Forerunner structure. Another view of the one of Haven's ramps. A group of columnlike structures on Haven. A man cannon on Haven. Haven loading screen, as seen in Halo: The Master Chief Collection. Overhead view of the map. ↑ Guardian.co.uk: Halo 4 multiplayer revealed: Master Chief meets Call of Duty?